It’s been a little while since I posted an update on the Shion 2 progress. Overall, progress is going well, but there have been a few snags. AppleScript: AppleScript will not appear until 2.0.1 because the new Shion object model needs to stabilize somewhat before I commit to setting up the scripting dictionary (which is a pain to change once established). Thermostat Support: I removed thermostat support from 2.0 because I need more time to test how the software interacts with the Venstar units before I set it loose upon the world. I’ve noticed a handful of oddities in my own setup, so this is now a 2.0.1 feature. I’ve been busy working on this release, and I wanted to start off by giving a brief tour of 2.0b3, the latest build. The main devices window remains almost identical to the preview from a couple of weeks ago and still very much like the Shion 1.x window. Snapshots are back in Shion 2. For those new to the application, a “snapshot” is virtual recording of the local environment. Taking a snapshot is a quick alternative to writing a script or exhaustively describing each device in order to describe the state it should take. The “+” and “-” buttons on the left add and remove new snapshots, while the “-” button toward the right allows users to remove devices that should be excluded from the snapshot. (e.g. A snapshot for a bedroom should ignore the kitchen lights.) 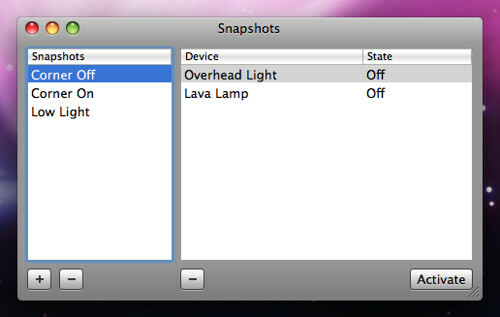 When a snapshot is activated, devices are set to the recorded states. Shion’s makes its functionality available from a status menu item. The major features are all there, as well as a live menu of your snapshots. 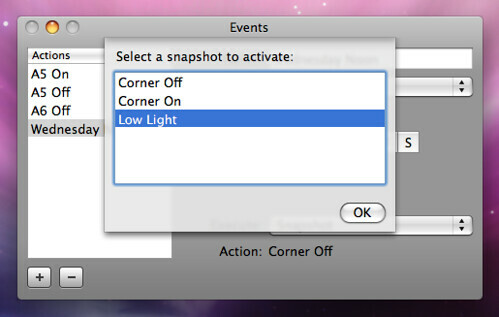 This makes selecting and activating snapshots much more convenient. A new feature in Shion 2 is the events manager. An event is an object that triggers an action. 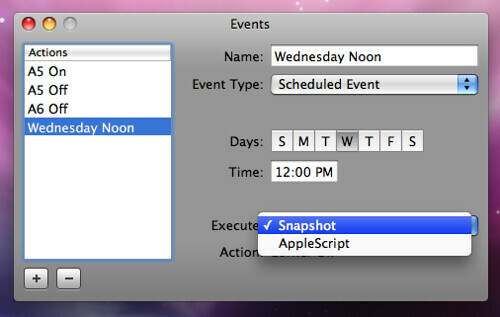 In the screenshot above, an event is fired every Wednesday at noon. The action that takes place can either be toggling a snapshot, or executing a custom AppleScript. 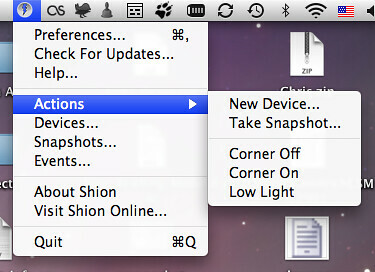 If a snapshot is selected as the action, Shion presents the user with a choice of the current snapshots. If an AppleScript is selected instead, the application will present a file open dialog to locate the desired script. 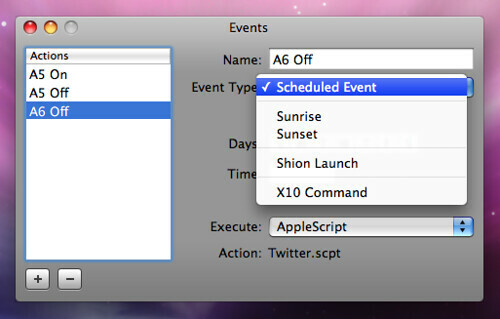 In addition to prescheduled events, Shion also supports a variety of other event types. Please note that this is only an starter list, and more event types will be added in future releases (temperature changes, motion detection, etc.). The new X10 Command event allows users to configure Shion to listen for X10 commands broadcast on the local network. In the example above, when Shion hears an “off” command broadcast to “A6”, it runs an AppleScript that logs a message to Twitter. 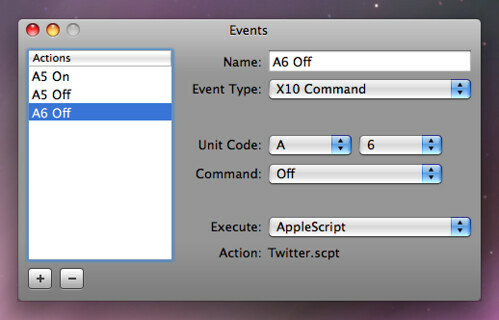 An X10 Command event can use any of the 256 X10 unit codes and the four X10 commands (on, off, brighten, dim). For users of mixed X10 and INSTEON environments, this mechanism can be used to bridge the two technologies. For example, a user can create a snapshot containing a single INSTEON device and use an X10 Command event to map an unused X10 code to the snapshot. 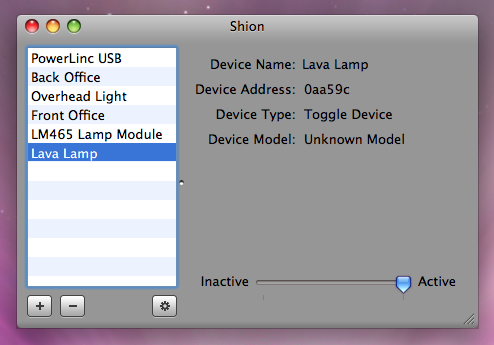 When the user sends the command using a typical X10 remote control (which are much cheaper than their INSTEON counterparts), Shion intercepts the command and activates the Insteon device. I’m very excited about this new functionality and I’m looking forward to seeing it grow in functionality in the months ahead. In addition to the new interface details above, I’m happy to report that Shion now includes support for the CM15A X10 USB controller and the CM11A X10 serial port controller. This means that Shion is no longer dependent upon INSTEON technology and can be used to control pure X10 environments as well. The new open-source framework is working out quite well and will be expanded in the future to include new home automation platforms and controllers. After the dust following the Shion 2.0 release abates, I’ll spend some time packaging and documenting the framework for interested open-source developers. As I mentioned above, I’m working hard to make Shion available for purchase by the end of the month. I’m well on track for meeting this deadline, now that I’ve deferred some features for a minor update release that should come out a few weeks following the 2.0 release. In a prior post, I mentioned that Shion 2 will ship in two flavors: basic and full. The main difference between the two was that basic would support a subset of the functionality described above, while the full version would support everything. I’ve reconsidered this decision and would like to announce a minor change. There will only be one version of the application. By default, it will ship in a limited configuration that includes all of the functionality described thus far, but limits the number of controllable devices to 3. This mode is intended to allow potential users to test Shion against their own environments and work out any issues (on their own, or with help from me) before purchasing the software. I hope that this lower price will persuade you to support future Shion development and that you’ll consider sharing home-automation technology with your friends and family. My goal for this application is to bring home automation to everybody in a way that is usable (no tinkering required), affordable (no more Nintendo Wii vs. smart home debates), and robust (it just works). If this sounds appealing, stick around and give Shion 2 a try in a couple of weeks.